Today was a beautiful winter day. One perfect for a challenging hike up a trail I’ve longed to summit for awhile now. 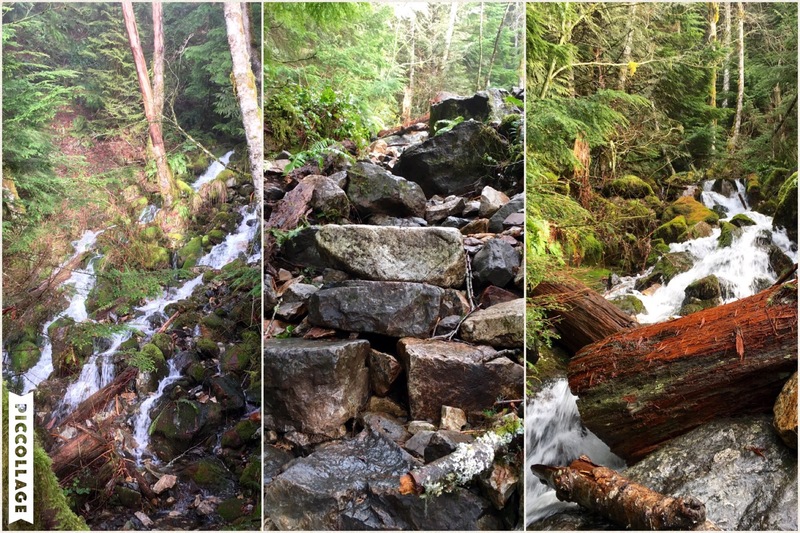 With peek-a-boo blue skies and calm winds, it was finally time for me to make it back to Kamikaze Falls and attempt the “old” trail all the way to the very top of Mt. Teneriffe. 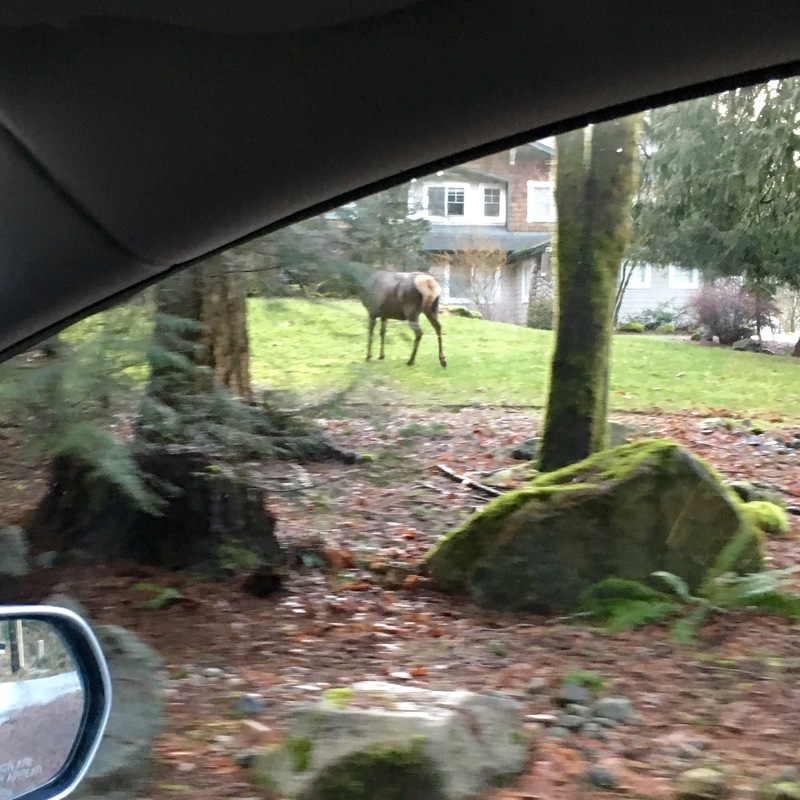 I eagerly entered the nondescript trailhead at the school bus turnaround just before 8:45 am, after a quick 25-minute drive along I90E and immediately following an unexpected road-crossing of a young elk. Compared to Mt. Si, Mt. Teneriffe’s well-known neighbor with its equally busy parking lot, the modest entrance to this trail comfortably fits a dozen cars when school is not in session. Mine was the sixth vehicle to arrive, making me a relative latecomer this morning. 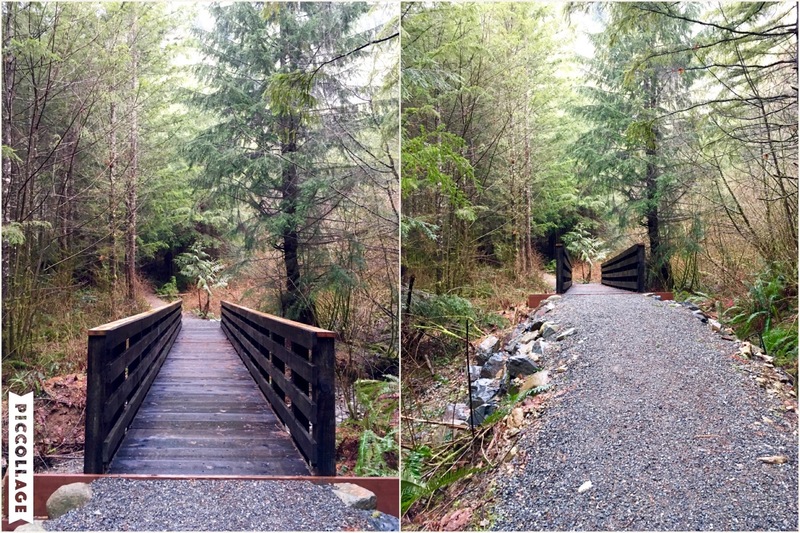 The “new” trail begins on a former logging road that has not only been converted, but has also been halved in width and refurbished with transplanted boulders, second-growth tree trunks and other natural ornaments typically found during a “walk in the woods.” I suppose the reconstruction of the trail here creates a fluid ambiance to direct hikers towards the bridge unto the longer 13.8 mile round-trip hike up the mountainside. Although I hoped to reach the summit today, I wanted to give myself a shorter (and lower) mid-point destination to aspire towards in the event I ran out of time and energy. 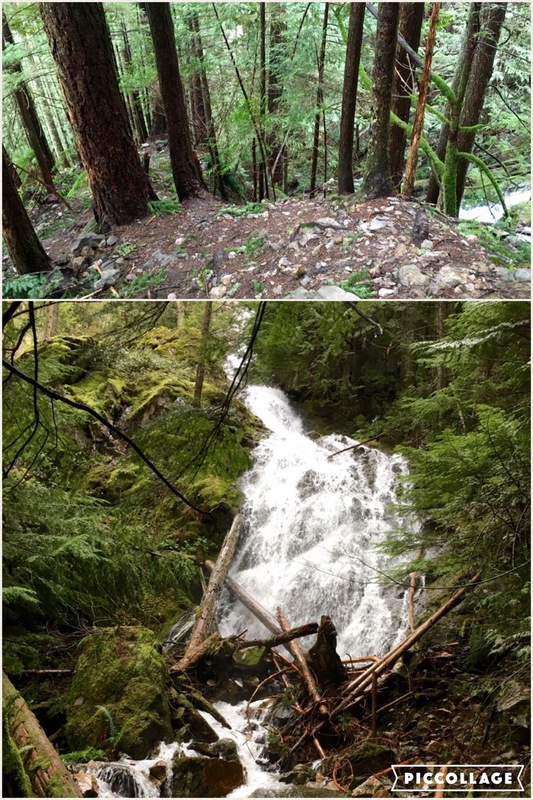 Instead of meandering up the lengthier trail, I opted to take the much shorter 6-mile trail to Teneriffe (aka Kamikaze) Falls, which veers right just before the bridge. 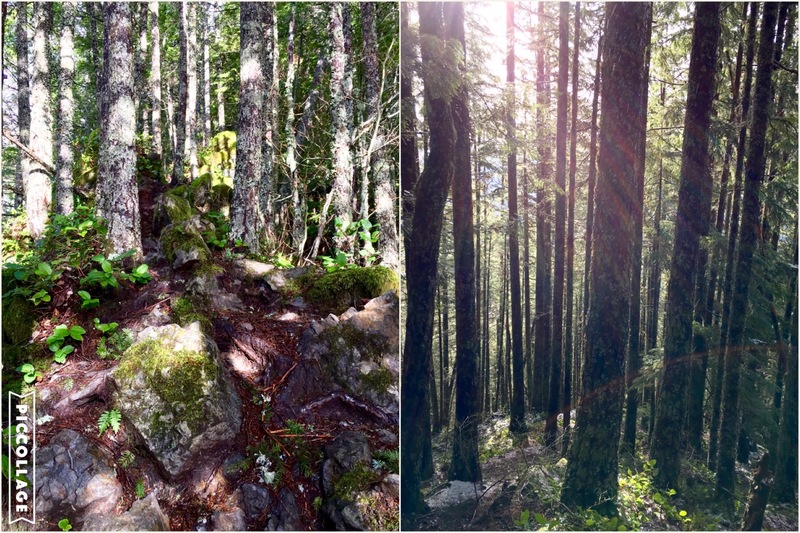 Having attempted this trail last spring with my two junior hiking buddies, I quickly remembered the loveliness of this trail as it winds up the southern slope of Mt. Teneriffe towards Kamikaze Falls. Unlike today, however, there was no music flowing through Kamikaze Creek when we last traversed this route in May. The nonexistent snow pack from the previous winter had left both the waterfall and its creek completely dry and withered. With El Nino in effect this season, every note on today’s musical staff was played as the water melodiously bounced off the many stones and boulders throughout its way down the Creek. It was a comforting song that lured me around the many switchbacks across the scree slope. The music was performed in the perfect setting, as this morning’s sunlight magically illuminated the mossy fur on old stumps as well as twinkled through dew drops born off winter buds. My junior hiking buddies enjoying the view of Snoqualmie Valley, May 2015. 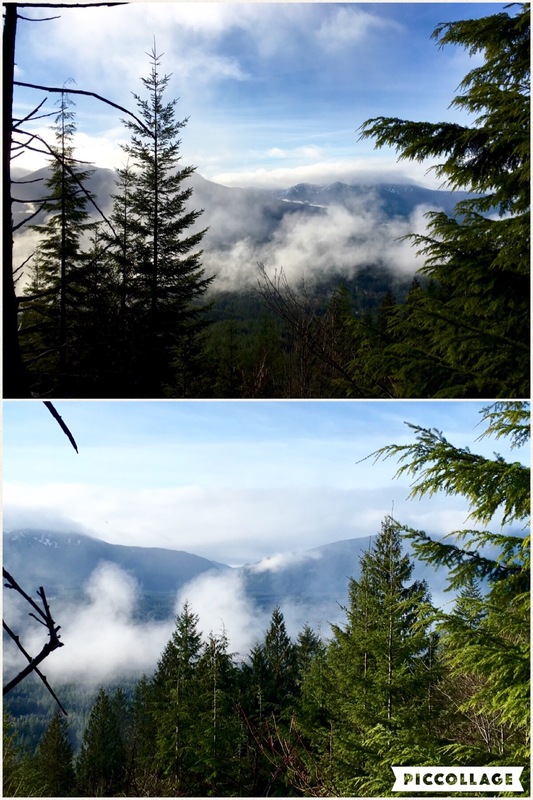 As I followed the trail through numerous switchbacks, I was repeatedly offered remarkable views of Snoqualmie Valley. My initial vistas on this cloud-streaked morning began with wisps of white floating over almost indiscernible peaks across the Valley. As I progressed higher up the slope, the clouds parted to show off the lustrous Rattlesnake Mountain, its Ledges and Lake in the near distance, as well as the snow-capped pinnacles of the Cascades throughout the region. Looking across to Rattlesnake from my present vantage point, it seemed surreal to know I’ve only been a momentary speck on this enduring mountain, even after having spent many a morning traversing its various trails. I could hear how close I was to my primary destination’s featured highlight: Kamikaze Falls. The music of the flow trumpeted in cascades down the steep ravine as I neared the base of the falls. 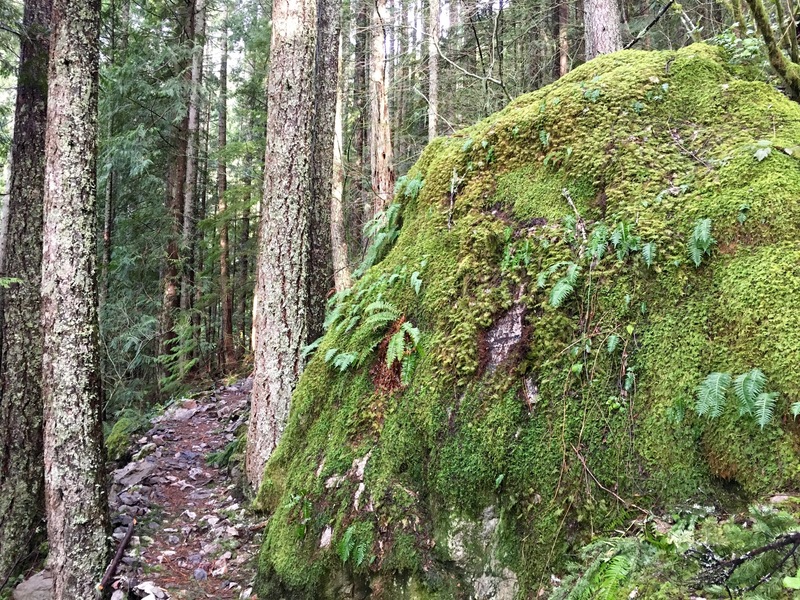 With the trail winding back into the forest at this point, I was granted a lush scenery of boulders overlaid with jade moss and and verdant ferns peeking through burnished stepping stones. This was an impressive welcome to Kamikaze Falls. Here, I met an older woman just returning from having witnessed one of nature’s spectacular displays. She told me she was only starting to explore her interest of hiking. I do believe, after being rewarded this amazing view today, she will continue to search for more wonders as I have in the great outdoors. When I finally made it to the base of the waterfall, I was bedazzled by the perpetual flow of water over the distinctive edges of the talus wall. Each separate cascade seamlessly merged into the next until all became a complex, yet complete symphonic movement. Breathtaking. Arresting. Inspiring. It must have been obvious how delightfully moved I was by this vision, since an older gentleman standing beside me noted how he also enjoyed being next to the waterfall. We struck a conversation about the beautiful trails the area has to offer, trading suggestions of where next to explore (he about Mt. Rainier and me about the peaks along the I90 corridor). As we parted ways, we both hoped we would see each other on the trail again soon. I realized it was only 10:30 am at this point. Since I still had a great bit energy left, I decided it was worth a try to summit Mt. Teneriffe via the old trail. I crossed over the rocky trail and followed a pair of experienced hikers up the steep climber’s path. Within minutes of doing so, I was transported back to the pain I felt during my journey up Mt. Defiance, one of my first truly challenging solo hikes. Just like it was there, the route here is nothing more than a steep wall filled with never-ending obstacles of loose rocks and entrenched roots made all the more difficult with the slippery slush of melting snow. With my 30 lb. pack tightly buckled behind me, I needed to readjust my sense of balance over each scramble to the next step or risk toppling backwards down a nearly vertical path narrowly lined with trees. This was more like free-soloing than top-roping, yet nothing as nimble and graceful as either sport. Someone needed to tell those mountaineers ahead of me not to be so agile and quick, since I myself couldn’t as they had already disappeared into the ether above. It didn’t take long before I entered a land completely encrusted with milky white flakes as far as my eye could see. 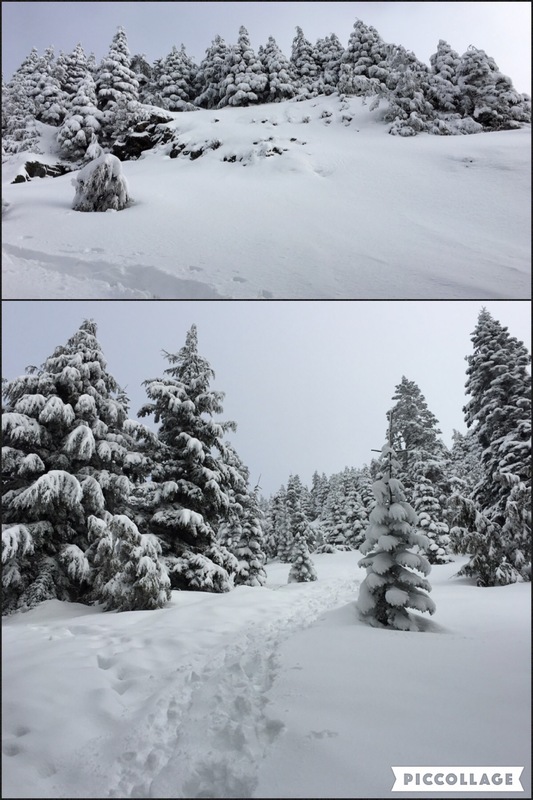 The route was no longer a bootleg trail up the slope, but rather a boot-tracked path through the deep snow. To make it a more memorable experience, the frost-tipped limbs of the trees towering above continually shared with me their icy jewels. 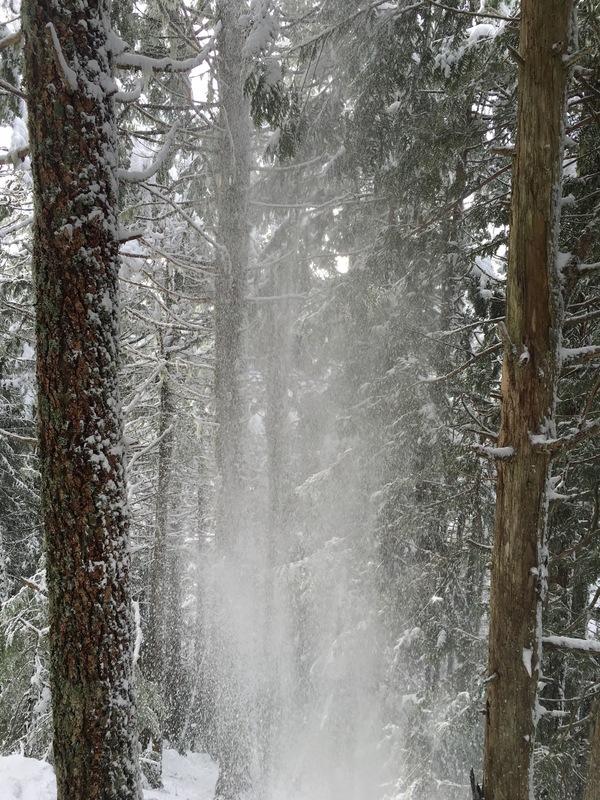 With the sun shining through the clouds at this point, I was repeatedly showered with snow-valanches melting off branches as I passed under several conifers. I either needed to turn back at this point or find my way out of this forest of trees quickly. I couldn’t handle being pelted by crusty shards of snow anymore. 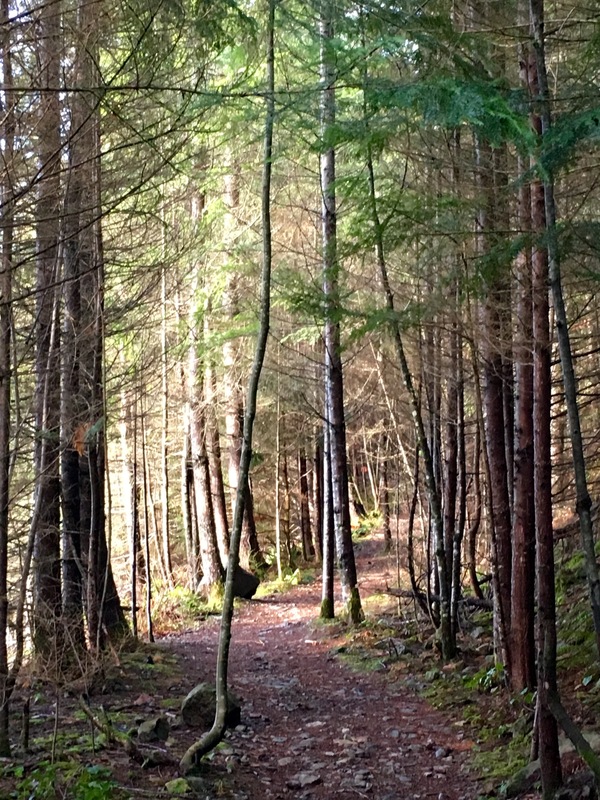 Of course, there seemed to be no end in sight as I looked up the mountainside through the infinite line of trees. What to do!?!? After determining I had another 500 ft. of elevation left to climb, I carried forward my intent to summit Mt. Teneriffe today. My Hillsound Trail Crampons got me through the next 250 ft. up the slope, but it didn’t seem to be enough to get me to my goal. My grit was quickly dwindling under the growing weight of my pack. As I spied a rocky bluff just beyond the trees, I decided this arbitrarily chosen object would be the optimal point for me to turn back in this seemingly endless quest. 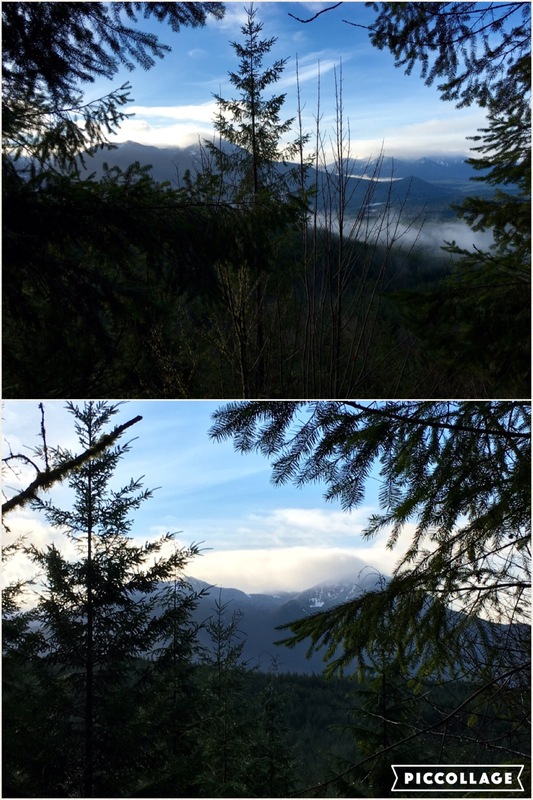 I thought – correctly – that the open slope would offer me unobstructed views of the Cascades to the south. Just as I reached the bluff, out came two exuberant hikers, J and K, making their way down from the summit. When I told them of my intent to head back from there, they offered me such great words of encouragement that I was reinvigorated enough to make it to the very top. J’s experienced suggestion to slowly move ahead step-by-step rather than powering on like a machine made such a world of difference that by the time I actually made it to the summit, I was completely (well, almost completely) revitalized. Like most true mountain peaks, the summit of Mt. Teneriffe is literally a single vertex at the tip of a cone. There is nothing particularly spectacular to define it, except for the unobstructed 360 degree view of the Cascades and Pacific Northwest its pinnacle geographically provides. I fully basked in my reward after realizing this simple fact – of course, following a masochistically rugged climb straight up the mountain. Before even bothering to take in the views surrounding me, I dropped my pack and enjoyed the piping hot mocha I made this morning as well as a delectable square of the rich chocolate brownies Little Hiking Buddy and I baked together the other day. Perfection on the summit. As I enjoyed the remainder of my lunch, clouds billowed in and out of my view. In one moment, stupendous panoramas of Snoqualmie Valley and alpine-laced peaks were clearly revealed all around me; yet, in the blink of an eye, there would be nothing but an infinity of white upon me. This was the definition of ethereal: the view, the clouds, and my journey were all too delicately beautiful to be a part of this world’s reality. And yet, this magic was spectacularly true. Just then, a snow-covered Haystack, resting atop Mt. Si, came into perfect view. It was as picturesque from above as it was from below and from on top. I would say this view was even more special knowing I didn’t have to share it with anyone today. After I packed up, I descended as slowly as I had come up the vertical line of loose snow. 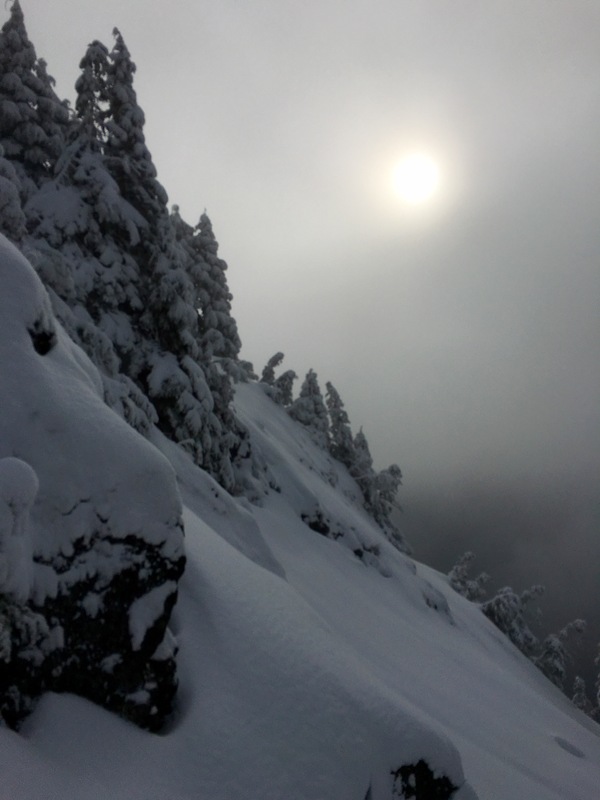 Once I made it safely back into the trees, I came across three hikers snowshoeing their way up to the peak. I was quite thankful they had compacted the snow along the trail, making it that much easier for my crampons to bite into the ground for surer footing. My descent was now at a faster pace, allowing me to maneuver through the snow-valanche minefield without being targeted. I somehow caught up to J and K, the happy pair of hikers I met near the summit, just at the end of the snow line. From there, we three descended the trail together, convivially chatting about our world travels, hiking explorations and life goals. Between the mutual experiences, unexpected encounters and ridiculous humor among strangers, I realized today that hiking alone doesn’t have to be lonely.